Editor's note: Ned E. ('17) tells us a bit about nautilus, and his research with them. 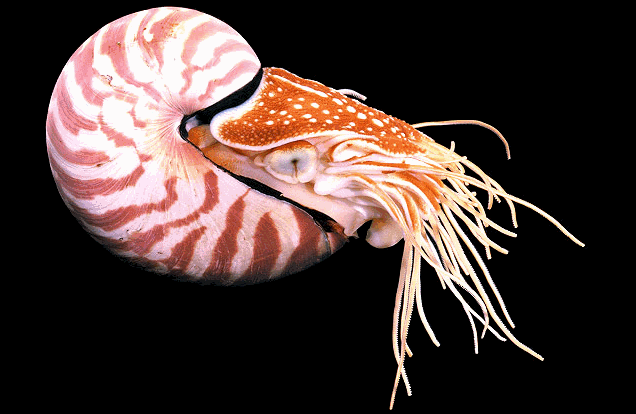 ​The chambered Nautilus (as pictured above) is a deep-water mollusk. It migrates at night to scavenge and find food along coral reefs. This involves navigating sea planes and rising and falling 100s of meters daily. They do this by filling their chambers with gas and liquid (to maintain buoyancy) and using the spout for power. While threatened today these creatures flourished, being one of the most successful species of their time, 500-60 million years ago. The nautilus has not evolved much from this period and is considered a “living fossil”. Because of this, the nautilus lacks the complex brain and behavior repertoire of its soft-bodied relatives, such as squid and octopus. But through many studies it has been proven that their spatial learning ability is likely better than originally thought and many interesting patterns arrive once the nautiluses are examined more fully. At my lab, in Brooklyn College, we preform experiments to determine how the nautilus learns and adapt (in tank settings) and try to transfer this knowledge towards understanding the evolutionary history of Mollusks in general.